Anglers can catch the Golden Tile Fish all throughout the Gulf of Mexico and the Atlantic Ocean. Anglers in the know often request Golden Tile Fish during their charters. They are a curiosity because the fish are certainly something unique. Captain Moe’s Lucky Fleet does not solely book charters focusing on Golden Tile Fish; however, we do help our anglers hunt them down and catch one when possible. Like many of the fish we battle with here at Captain Moe’s Lucky Fleet, the Golden Tile Fish is found in deep, cold waters – usually around 600 or 700 feet in depth, but sometimes even further down. We have several boats available in our growing fleet to charter those looking to catch their own Golden Tile Fish. The Golden Tile Fish is an incredibly beautiful species. Their sides are general aqua-blue with a few green highlights throughout, and the back features a unique blend of blue-yellow and blue-green. A reddish-pink band runs down each side. In the end, golden is not a misnomer. The fish is quite golden and delectable in taste. Golden Tile Fish can be caught in deep waters, meaning our 42-foot custom Stapleton Sportfish, the Lucky Charm, is perfect for trolling the blue waters. Our fleet is equipped with the latest reels and rods, a large cooler, and comfortable battle-ready seating for a long fishing trip. By the end of the day, you’ll have caught one of the fish on your bucket list and snapped a few pictures for the road. 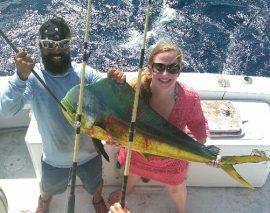 To book a fishing charter in Key West, contact Captain Moe’s Lucky Fleet by calling 305-306-8065. Our experienced crew can walk you through the process of catching your first, or hundredth, fish, or simply entertain you with stories from our past trips!